Should a scribe goes for extracting of personal information of an individual, which is illegal in India, and then submit the details to a politician in power-this is the debate presently gaining momentum in Assam. The debate has also raised the pertinent question, whether a journalist has the ethical, moral and legal right to trace someone's call records for a non-journalistic purpose. The issue came alive after a State minister claimed that he received a call list of an individual, which has become useful for his political dispute. Dr Himanta Biswa Sharma, the health minister and the spokesperson of Assam government, in a formal press meet at Rajiv Bhawan in Guwahati on April 11, 2009 claimed that three opposition parties were inherently working to ensure the defeat of the Congress candidates in the Lok Sabha polls. According to him Asom Gana Parishad, Bharatiya Janata Party and Asom United Democratic Front were collaborating under the initiative of Hiranya Saikia, a member of People's Consultative Group (formed by the banned United Liberation Front of Asom). Dr Sharma claimed that Saikia was in constant touch with many senior leaders of these parties in the last few days. In support of his statement, the minister even distributed the call records of Saikia's cell phone to the reporters. Even though the AGP and the BJP had the formal electoral tie up this time, Dr Sharma asserted that, they tried to achieve an inherent understanding with the AUDF, which is a minority interest oriented political party, with Saikia's help. The press conference of Dr Sharma was telecast live by a Guwahati based satellite channel News Live, where the minister specifically informed that he got the call details of Saikia's personal phone from a ‘journalist friend.' The programme passed off coolly, but it aroused a pertinent debate among the media persons in Guwahati, whether a journalist has the ethical, moral and legal right to trace someone's call list and submit it to a minister. Rajdeep Sardesai, the editor-in-chief of CNN-IBN and also the president of Editor's Guild of India termed the exercise (of the journalist) as unethical. Similarly, DN Bezboruah, a senior Assamese journalist and the former president of Editor's Guild commented in the same tune. DN Chakrabarty, former editor of Dainik Asom has criticized the journalist as a black-sheep in the profession. "He (or she) should be condemned in strongest words. More over, the behaviour of the minister was also equally unacceptable. The minister should not try to use a journalist for his vested interest," Chakrabarty added. Paritosh Mukhopadhyay, general secretary of National Federation of Newspaper Employees, termed the act of the journalist as ‘immoral, unethical and illegal.' Speaking to this writer from Kolkata, Mukhopadhyay asserted that the tainted journalist should be dragged in to the court under the press council laws. He also insisted that the issue must be brought to the notice of the Information and Broadcasting ministry and the Prime Minister's Office. The forum was critical to Dr Sharma as well saying, “For the sack of argument, even if the call list was collected by the minister from a competent authority with legal formalities, the JFA demands a public apology from Dr Sharma, as he tried his best to defame the integrity of the journalists. This is not the first time, when Dr Sharna dragged himself in to a controversy. But the latest controversy invited criticism and condemnation to the minister as well as his party in a crucial time, as Assam was embracing the election on April 16 and 23. However everyone in Assam admits that Dr Sharma is an intelligent, brave and efficient minister, though he often speaks reckless. A responsible minister in the Congress led Tarun Gogoi government, Dr Sharma has grown both his political clout and personal properties. Today he owns a Satellite Television channel too (for record, his wife serves as the CMD of News Live, one of the three satellite news channels of Northeast India). The young minister remained silent on the identity of the tainted scribe, but troubles continued brewing for him from other fronts. Hitting back at Dr Sharma, Hiranya Saikia alleged that the minister indulged in an illegal act attempting to intrude into his personal life. Saikia has already sent a legal notice to the Reliance Telecom for providing his call list to somebody else. 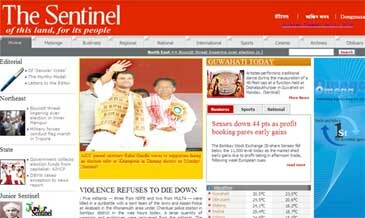 The Sentinel, a leading English daily of Northeast, editorialized the issue arguing that ‘what Hiranya Saikia told the press the very next day has completely shaken Sarma’s — and the Congress’ — high moral ground’. The editorial finally questioned Dr Sharma’s right to get Saikia’s phone call detail records. “The minister, with an equal zeal as manifest in his allegations against opposition parties, should have also made it known as to how he could lay his hands on an individual’s private domain,” the editorial concluded. Meanwhile, the leaders of AGP, BJP and AUDF termed Dr Sharma’s revelation as baseless. More over, both the AGP and the BJP had lodged complain in the office of Election Commission demanding legal actions against Dr Sharma. The senior BJP leader SS Ahluwalia while talking to local reporters in Guwahati garbaged the allegation and charged that Dr Sharma illegally collected the call records of an individual. The BJP Prabhari for Assam also asserted that the act revealed the misuse of the government machinery by the minister.